The unemployment number: Is Gingrich right that it’s flawed? If the unemployment number is good enough for Gingrich, it should be good enough for Obama. Regardless, we looked at the speaker’s preferred metrics to determine whether they really paint a gloomier picture of the job market. Do they disprove the Obama supporters who say the economy is making progress? Lori Williams of Tableau Software kindly developed some graphs for us to help readers visualize the data. The numbers in question come from the Bureau of Labor Statistics, which defines the unemployment rate as the percentage of people in the workforce — those who are actively seeking work — who haven’t landed jobs. It does not count part-time workers or individuals who dropped out of the labor force. Gingrich suggested that two alternative metrics could work better for gauging the health of the job market. The first measure, called the U-4, includes both unemployed adults and those who’ve stopped looking for work because of the economy. The second is the U-6, which represents the adults who are unemployed, marginally attached to the labor force and employed part-time due to economic reasons. These metrics are more inclusive than the unemployment measure, so the numbers look worse no matter which administration you look at. Obama is not special in this regard. Neither of the alternative metrics means much on its own, at least not in the context that Gingrich discussed them. To test the former Speaker’s theory that they reveal something worse about the economy, we had to determine whether U-6 growth has outpaced the increase in unemployment. If so, we could assume a problem. We’ll forego discussing every data set Gingrich mentioned, since they show the same trends. Instead we’ll compare just the U-6 and unemployment figures. 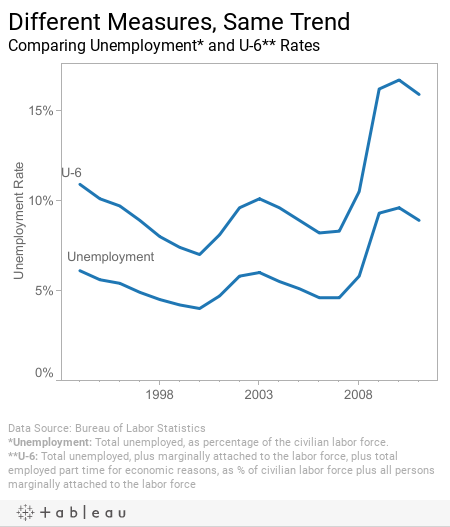 In 2011, the U-6 rate was 7 percentage points higher than unemployment, easily the widest margin on record with the BLS, which has published U-6 data going back to 1994. The average gap before Obama took office was 3.9 percentage points, and the average has increased to 4.4 points since he entered the White House. This indicates a problem, but the margin decreased one-tenth of a percentage point in 2011, meaning the trend moved ever so slightly in the right direction last year. For what it’s worth, the margin between the U-6 and unemployment shrank every year under President Clinton, and it fluctuated under President Bush, growing during the economically troubled years that bookended his tenure, but shrinking during the middle years. The takeaway is that U-6 growth has always outpaced unemployment growth when the economy sputters -- or when it takes a dive like it did in 2009. The highest margin on record occurred under Obama, but he inherited the worst recession in modern times, along with his predecessor’s solutions. Suffice it to say that the employment bleeding has stopped for now, no matter which metric you look at. We’ll have to wait until the general election to determine whether the president’s policies can narrow the gap between U-6 and unemployment to anywhere near its previous levels. For now, it’s a long way off. Conservative pundits have tried to discredit the recent unemployment numbers by suggesting that Obama pushed the BLS to fix the numbers in his favor. Washington Times writer Joseph Curl implied as much with a recent column in which he pointed out that monthly labor-force participation dropped 2.1 percentage points between December 2008 and January 2012. He notes that the rate remained relatively steady under Bush, which is true. We don’t need to examine labor-force participation rates for this column, because the U-6 number accounts for that. But we did decide to find out whether anything fishy was going on with the BLS’s population-control adjustments, which are essentially what Obama’s critics have complained about. This is nothing new in terms of methodology, so there’s no reason to think the BLS stacked the deck in Obama’s favor, as Curl suggested. “It was a normal, re-curring practice we do every January,” said BLS economist Steve Haugen, adding that the same methods have been used during previous administrations. “Rather than base unemployment estimates on highly subjective criteria such as whether or not a person out of work merely wanted a job, the activity concept used information on a person's actions to determine his or her labor force status. As for Gingrich’s claim that the male participation rate in the workforce hs reached its lowest level since the 1940s, he’s right. But that’s been the case most years since 1948, the first year on record with the BLS. Male participation has declined steadily since then, dropping from 86.6 percent to its most recent 70.5 percent. The decline under Obama has been especially drastic at 2.5 percentage points, compared to 1.8 percentage points under George W. Bush, 1 percentage point under Bill Clinton, and four-tenths of a percent under George H.W. Bush. But again, Obama inherited the worst recession in modern times. The U-6 numbers show a severe increase in joblessness during the height of the “Great Recession,” followed by a slight improvement during the past year. Unemployment data shows the same thing. Sure, the U-6 number looks uglier on its face, but it doesn’t make the jobs market appear any worse once you put the numbers in perspective. The fact remains that the situation has improved, albeit slightly. The former Speaker was correct about the decline in male workforce participation, but the general trend extends well beyond Obama’s years in office. Overall, Gingrich earns one Pinocchio. His numbers were right, but he missed the mark by suggesting that his preferred metrics tell a different story about the jobs market. In the end, it’s improved no matter which way you look at it.